Ear mites (Otodectes cynotis) are very small crab-like parasites found in the ears of animals. These parasites are very common in cats, especially those who go outdoors. Cats that are affected by ear mites will become uncomfortable and itchy. Ear mites are easy to see, too. A cat that has ear mites will have what looks like oily black dirt inside the ear. These parasites live in the ear canal, just on the surface. The ear mites feed on tissue and debris inside the ear. If you notice your cat scratching their ears or shaking their head and see dirty ears, it is likely that you cat is suffering from ear mites. It is important to treat your cat for these parasites. They are highly contagious among cats and if you have multiple cats, it can spread quickly. If one of your cats gets ear mites, carefully check all of your cats for this problem. Also, ear mites can be passed to and from other species including dogs. Ear mites can also affect humans, so treatment is essential. Ear mites can cause inflammation in the ears. If they are left untreated, these pesky parasites can lead to bacterial and yeast infections and can rupture the eardrum. Many times, ruptured ear drums in cats can lead to seizures and eventually deafness. If you suspect that your cat has ear mites, take your cat to the vet. There are treatments that can help your cat get rid of the ear mites. The best prevention of ear mites is to keep cats indoors and to treat your cat regularly with flea prevention. There are several types of flea prevention treatments that your vet can prescribe. 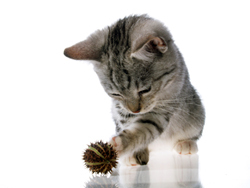 These are usually given to your cat once a month and will kill fleas, eggs and prevent ear mites. Treating just the ears is usually not enough to get rid of ear mites. Because ear mites can survive off of the cat, it will be necessary to treat your home, the cat’s fur and the environment, such as bedding, where your cat spends a lot of time. When you take your cat to the vet for ear mites, there is a type of eardrop that can be used to kill the ear mites. This is usually given to your cat two to three times a day for several days. Before treatment begins, it will be necessary to thoroughly clean the cat’s ear. It is recommended that a vet do this instead of doing it at home. Prescription eardrops are then given to the cat. This will kill the ear mites and will also prevent a second outbreak. Because ear mites can live for three weeks, prescription drops are usually given for at least a month to prevent further outbreaks. Injections can also be given at the vet’s office for treatment. Ivermectin is another treatment for ear mites in cats. This is a relatively new way to treat ear mites. The FDA, however, does not approve this treatment, for treating ear mites. Many vets find Ivermectin to be very effective for treating ear mites and should tell you that it is not officially approved for this use. This medication is the same medicine used to treat heartworms in dogs. There is a treatment that can be done at home if you are extremely careful with your cat’s ears. This treatment should not be used though, if the ear mite outbreak has caused an ear infection. If your cat has an ear infection, he or she will usually have a strong odor in the ears. For treatments at home, use a small amount of baby oil or mineral oil to clean out the cat’s ears. Put a small amount of the oil on a cotton ball or swab and gently wipe the cat’s ear out. Be very careful not to put the cotton swab inside the ear canal. This can cause serious damage to your cat’s ears. This treatment should be continued twice a day for at least a month. When treating your cat for ear mites, it is very important to seek the advice of your vet before beginning any treatment. Most of the time, your vet will want to examine your cat before proceeding with any course of treatment. A thorough exam can rule out more serious problems like ear infections that should be treated differently than ear mites. Most of the time, your vet will ask that you bring your cat back to the office for another exam after the treatment is complete. This is to make sure that all of the ear mites are gone and reduces the chances of re-infection.